Stop by this Saturday to sample a couple of exceptional wines from the Roussillon region of southern France — available in attractive wood six pack boxes for the perfect gift of wine for a loved one or yourself. The Chapoutier family’s roots in the Rhône date back to 1808, when they first began producing wines in Hermitage and Côte Rôtie. Although the family acquired a number of excellent vineyards throughout the Rhône over time, and became one of the most important names in the region, the winery began to languish in the 1980s. 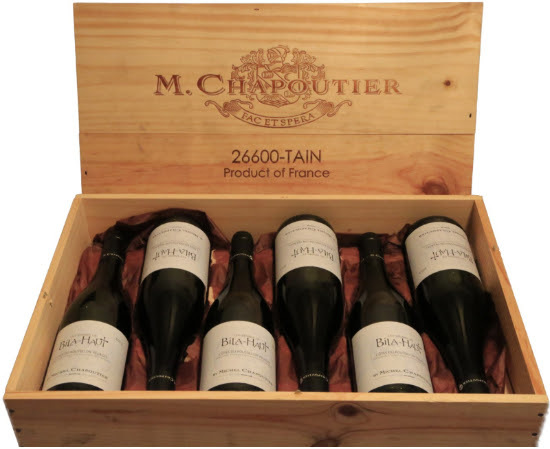 That all changed when Michel Chapoutier took over the family business in the early 90s. He lowered yields, began cultivating the vineyards using organic and biodynamic practices, and sought to create wines with more finesse, making Chapoutier one of France’s first great merchant houses to follow the path of leading private domains at the time. Michel Chapoutier is now regarded as one of France’s superstar winemakers and he has taken his passion and commitment for viniculture to some of the best slopes in Roussillon around the River Agly in the foothills of the Pyrénées. The Domaine is located in Terres Catalanes, in the Côtes du Roussillon Village of Latour de France. This is a land of sunshine – an average of 325 days per year. Black and brown schist give the wines a solar touch, gneiss adds minerality and freshness, and then a combination of limestone and chalk provide the strength and balance. These are serious wines from a region that continuously shows its potential for greatness as more ambitious winemakers move in. The 2013 Chapoutier “Les Vignes de Bila-Haut” Côtes du Roussillon Villages (90-92 points Wine Advocate) offers a fresh and layered profile. It’s a blend of mostly Grenache, Syrah, and Carignan brimming with earth and red fruits. It drinks well now and will evolve in a cellar for a few years to come. A step up in concentration, the 2013 Chapoutier Domaine de Bila-Haut “Occultum Lapidem” Côtes du Roussillon Villages Latour de France (94-97 points Wine Advocate) is made from a mix of Syrah, Grenache and Carignan. Although full-bodied and intense, and exuding mineral and dark berry aromatics, it’s never cumbersome, and will develop in a cellar for another decade.